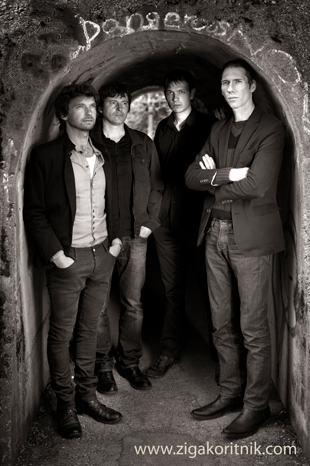 The group Hic et nunc has been active since 1990 and is one of the architects of the rock'n'roll revival which stroke Slovenia in the beginning of the nineties. In 1995 first album "Hic et nunc" was released and was selected by Radio Študent "The Record of the Year" in the face of strong competition. Many gigs followed; the band played in clubs and performed at festivals in Italy, Greek, the Netherlands and in Sarajevo. The record received excellent review in the American music magazine Flipside. In December 1996, we recorded second album entitled "Lava" in Zagreb. EP "Howling Monkeys' Blues" was released in April 1998. In September 1998, band toured USA together with Dicky B. Hardy under the auspices of FV MUSIC label. At the concert in St. Louis legendary Beatle Bob listed performance of Hic et nunc as the third best among over 500 gigs that he had visited that year!. Fourth record entitled "Manitu was released in December 2002. it was received extremely well by the media. Videos for the songs "Death in the Desert" and "You Drive me Mad", directed by Tomo Brejc, reached top places in video charts. The visual image of the Manitu project (photography and video by Tomo Brejc) featured as a part of the exhibition Sodobne slovenske graficne izkušnje (Contemporary Slovene Graphic Experience) in the A+A Gallery in Venice. In November 2004, new tracks for the fifth LP record entitled "Burn Fat Old Sun" were recorded. Chris Eckman, leader of the famous American group The Walkabouts, and the legendary Texan Terry Lee Hale were guest musicians on tracks. Chris Eckman also acted as the producer of the album. In last few years, members of the band are highly active in other projects. Bruno Subiotto sings and plays in two bands, Incurabili and Dicky B Hardy. Luka Krže plays drums in garage rock'n'roll band, The Real Things. Tomi and Bernard are playing in The Frictions.. In 2011 was recorded "One More Cup Of Coffee (Valley Below)" for a tribute to Bob Dylan album.